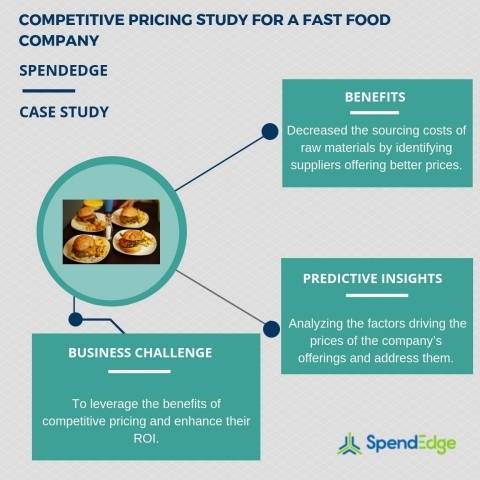 SpendEdge, a leading provider of procurement market intelligence solutions, has announced the completion of their competitive pricing study for a fast food company. The client wanted to devise a pricing strategy that could help them sustain their profitability in the competitive landscape. The time decided to achieve this business objective was twelve weeks. Objective 1: The company wanted to leverage the benefits of competitive pricing and enhance their ROI. Objective 2: They were interested in implementing new initiatives that can help them to reduce sourcing costs of raw materials. Want to explore better options to boost ROI? Request a free demo from our experts and determine the factors impacting competitive pricing strategy. "Implementing a competitive pricing strategy is vital for companies to stay ahead of the businesses selling similar products as the attributes of the products remain similar," says a procurement expert from SpendEdge. Decrease the sourcing costs of raw materials by identifying suppliers offering better prices. Analyze the factors driving the prices of the company's offerings and address them. Analyzing the factors driving the prices of the products and services is crucial for companies to sustain their customer base and brand value. Request a free proposal and access our complete portfolio of competitive pricing solutions today! Outcome: The pricing experts at SpendEdge helped the fast food company to identify the interest of customers willing to spend on their products and raise the prices of their offerings by an average of 3% across the country. This helped them to achieve a 31% increase in the overall savings of the company. The pricing solutions further helped the company to gauge the cost-saving opportunities and make prudent business decisions. To access the complete case study on how we helped a fast food company implement a competitive pricing strategy, get in touch with our experts here!